Professor Patrick Bailey (Keele University / London South Bank University since September 2014) won the Leadership Award at Green Gown Awards 2014 Ceremony at the University of Manchester on 3 November 2014. Roisin Lyle-Collins (University of Glasgow) won the other individual award, the Sustainability Champion Award. The tenth award ceremony, hosted by Simon Reeve (author and TV presenter) and attended by over 360, announced the winners out of over 100 finalist projects from 62 UK tertiary education institutions. Organised by the Environmental Association for Universities and Colleges (EAUC), this event annually celebrates the exceptional sustainability initiatives in the tertiary education sector in the UK, bringing together the sector’s sustainability leaders, drivers and thinkers. 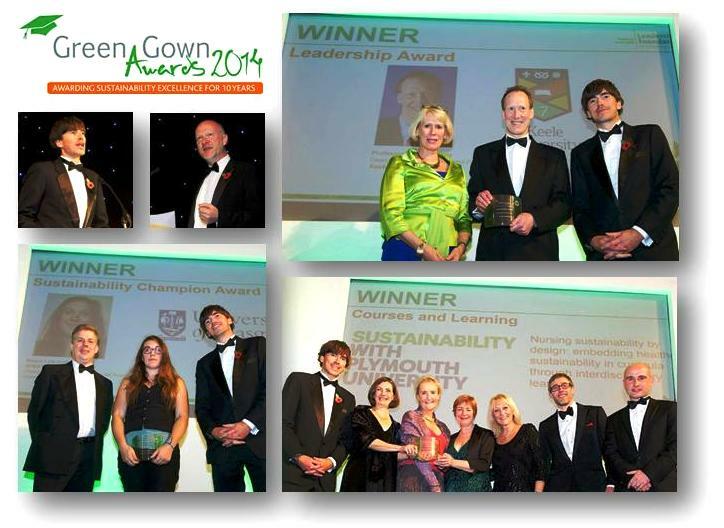 Meanwhile, the International Green Gown Awards 2014 winners were announced on 6 November 2014 at the ACTS (Australasian Campuses Towards Sustainability) Conference in Tasmania, Australia. In the fray were tertiary education institutions from Australasia, the United Kingdom, France, Switzerland, Belgium and Luxembourg. A game of plates at ‘Growth vs. Earth’ Café | Who depends on whom? http://www.linkedin.com/today/post/article/20140407045738-101066234-a-game-of-plates-at-growth-vs-earth-caf%C3%A9-who-depends-on-whom? News and Information related to sustainability in higher education.